I was pretty excited when Mustang invited me to experience the last installment of the Mustang Unleashed campaign in Las Vegas for Dashboard News and Bullz-Eye.com. We stayed at Planet Hollywood on the Las Vegas Strip and were witnesses for an incredible illusion. The 10th experience of the Mustang Unleashed campaign featured famous Las Vegas magician Steve Wyrick, who regularly performs at Planet Hollywood. We met Steve the night of the event and he peaked our interest right away with some incredible illusions as we enjoyed our drinks around the dinner table. We also met world champion drifter Vaughn Gittin Jr., who kicked off Ford Mustang’s ‘10 Unleashed campaign by taking the American muscle car to the streets of Japan to drift the streets where drifting was born. Vaughn is a Mustang fanatic and he was pretty pumped about his role in Steve’s plans. 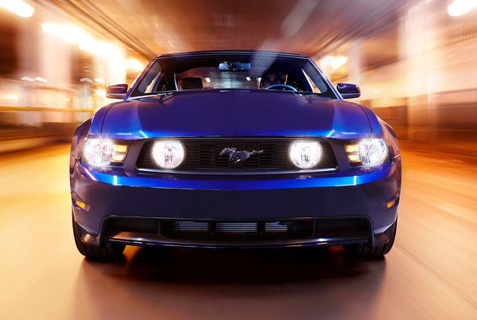 As a Mustang fanatic you can always find a way to upgrade your Mustang with different parts online. Ford and Wyrick shut down the Las Vegas strip to perform what was one of Wyrick’s biggest illusions yet. 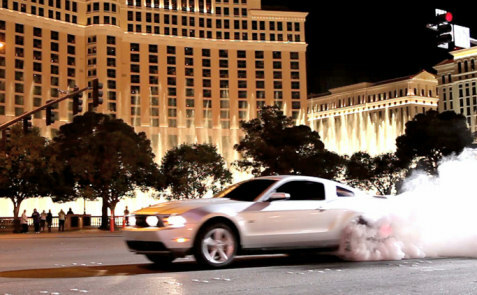 In front of Planet Hollywood in the middle of the night, Wyrick shackled himself in the middle of the Las Vegas strip and asked Vaughn to come racing down the street in the 2010 Mustang and slam into him. Check out the video below and you can see what happened next. Vaughn’s driving alone was a site the see, but that just set the stage for Wyrick’s big surprise. I have to admit it was just as spectacular seeing it live. The crowd that waited late into the night to see it wasn’t disappointed. This was the last of 10 dream Mustang experiences Ford brought to life this year with the Mustang ‘10 Unleashed campaign. Famous drifter Vaughn Gittin Jr. slid sideways around Japan, consumer Roger Keeney drove blindly, 18-year-old consumer Derek Murrell drag raced his high school shop teacher, Queen Latifah hit the track with NASCAR racing phenom Colin Braun and Los Angeles resident Daniel Verlarde got inked and customized his own 2010 Ford Mustang. Videos were created for each event and you can see them here. Tags: 2010 Mustang, 2010 Taurus, drift cars, drifting, Ford Mustang’s ‘10 Unleashed campaign, Las Vegas, Las Vegas strip, muscle car, Mustang Unleashed, Mustang video, Steve Wyrick, Vaughn Gittin Jr.